The Beatles' stereo vinyl box set has been issued in the US and Canada, following yesterday's release in the UK, Japan and Germany. The box set contains includes 14 albums including the Past Masters collection, and a bonus lavish 252-page hardback book by Kevin Howlett with a chapter on each album. Orders from the official Beatles store also include a bonus limited edition t-shirt. The albums are also on sale individually, although the hardback book and t-shirt are unavailable separately. The reissues use 180-gramme audiophile quality vinyl, with audio taken from the 2009 remasters. Unlike the 16-bit compact disc reissues from that year, the vinyl versions use the full 24-bit remastered audio. The albums Sgt Pepper's Lonely Hearts Club Band and Yellow Submarine come with additional inner sleeves. Sgt Pepper has a reproduction of The Fool's original inner sleeve design and an insert detailing the figures on the cover artwork, while Yellow Submarine contains the liner notes originally found on the North American release. Although artwork and liner notes have been reproduced faithfully, the reissues are not precise replicas. 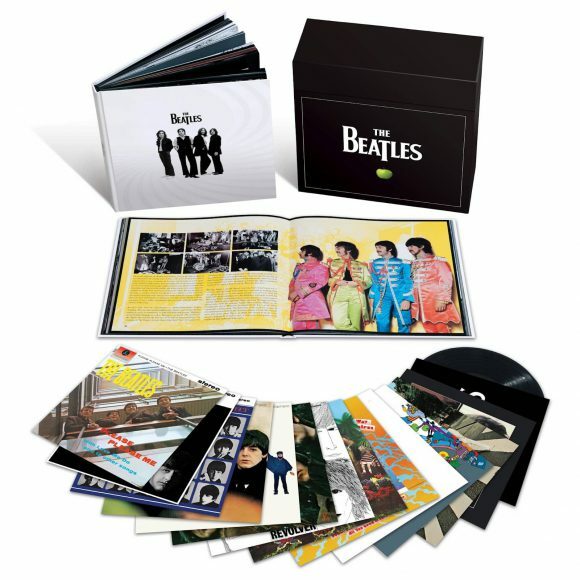 The sleeves are not the fold-over laminate covers with matte backs seen in the 1960s, and the single-ply gatefold cover for Beatles For Sale has been replaced by a double-ply one similar to Sgt Pepper's. The sleeve for The Beatles (White Album) are not top-opening, although the poster and portrait inserts are all included. A mono vinyl box set is due for release in 2013. A special double-decker bus decorated with The Beatles' logo travelled around New York and Los Angeles to promote the vinyl reissues. A London date is to be announced shortly. Yeees! For us who weren’t yet born at that time it’s the greatest way to really discover The Beatles, though it would have been better if the mono versions of the first albums (at least until sgt peppers) were part of the colection, instead of the stereo ones. Setting this aside, it’s great news!